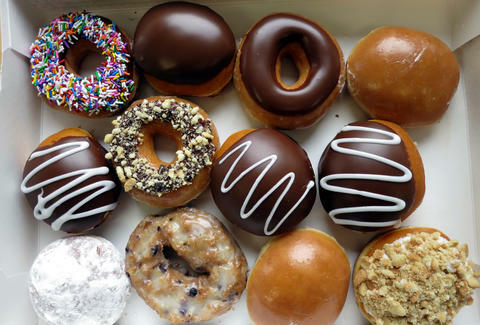 Krispy Kreme's donut game is undeniably strong, and its sweet doughy treats can rightly be found across the United States. That said, there are still some areas of the country where procuring a Krispy Kreme donut is nigh impossible, and that's a crying shame. Except, that's about to change for one lucky town. In celebration of its 78th anniversary, Krispy Kreme is offering you the chance to score a pop-up donut shop for your hometown, wherever that might be -- provided it's not in Alaska or Hawaii. All you've gotta do is tweet a photo, video, or shout-out with the hashtag #WinKrispyKreme, explaining why your town deserves a delicious donut emporium in the most creative and engaging way possible. Piece of cake/donut, right? The competition ends on June 29, and even if you don't end up winning, there's a silver lining: visit your nearest Krispy Kreme on July 10th, and you'll be able to score a dozen Original Glazed donuts for only 78 cents! Yes, you'll have to purchase another dozen at full price in order to get that savings, but since when was two dozen donuts a bad thing to have? Hit up the hashtag to check out your competition, then submit your own tweet for sweet, sweet donut notoriety.